Celebrating the renaming of three areas in the College of Southern Maryland Community Education Building to honor the Lilly family from left are CSM Faculty Emeriti and Former Dean of Arts and Sciences Josephine Williams, Joel Lilly ’76, Jay Lilly ’75, Chris Lilly, Mary Lilly, and former CSM academic adviser Maryland Del. Edith Patterson. 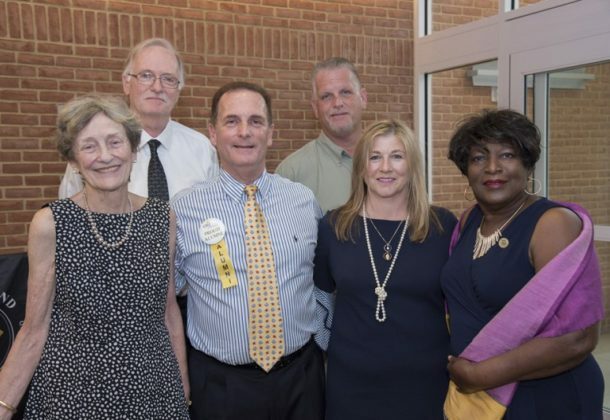 A ceremony at the College of Southern Maryland recently named the lobby, wing, and conference room in the Community Education Building at the La Plata Campus in recognition of the Lilly family and their recent legacy gift to the college. Brothers and CSM alumni Jay and Joel Lilly, and Jay’s wife, Mary Lilly, were recognized for their legacy planned gifts in support of CSM Foundation scholarships in the amount of $250,000 each, totaling more than $500,000. The various rooms were named in honor of them, and in memory of Jay and Joel’s parents Ethelmae and Reuben. The Lilly brothers started their college careers at CSM more than four decades ago. Both Jay, class of 1975, and Joel, class of 1976, said that they greatly benefited from scholarships when they attended CSM and they wanted to create the same opportunities for other students to learn and achieve. Their passion for CSM is evident. The Lilly family has established three annual and one endowed scholarship fund: the Coldwell Banker Jay Lilly Real Estate Scholarship Fund for Construction Trades and Industrial Training, the Coldwell Banker Jay Lilly Real Estate Reward for Referral Program, the Ethelmae M. Lilly Memorial Annual Scholarship, and the Ethelmae M. Lily Memorial Endowed Scholarship. According to the Lilly brothers, their CSM experience allowed them to further continue their education to prepare for their professional careers. Both transferred from the community college – Jay continued his college career at Georgetown University and Joel at the University of Maryland – earning their bachelor’s degrees and then returning to Southern Maryland to work and live. Today, Jay is the broker/owner of Coldwell Banker Jay Lilly Real Estate with his wife, Mary, and Joel is retired from his position as store manager at Southern Tire in La Plata. Jay has been a director on the CSM Foundation since 2008, serving as chair from 2013 to 2016. He was instrumental in launching the CSM Foundation’s recent Make an IMPACT campaign by making one of the first gifts when the campaign launched in 2015. Jay and Joel’s most recent gift of $250,000 each, helped the CSM Foundation to surpass its $12 million goal which will support scholarships, programs, technology and innovation, and entrepreneurship. “Many of us know the importance or impact of scholarships,” added CSM Foundation Chair Nancy Hempstead. “For many of our students here and across the nation, it is the difference between attending college, or not. It provides that opportunity to go full time, work less and focus on being a student. During 2018, the College of Southern Maryland celebrates its 60th anniversary. Established as part of the continuing expansion of the community college in America, Charles County Junior College opened Sept. 17, 1958. The La Plata Campus was established at its present location in 1968, with college services expanding to St. Mary’s County in 1978 and Calvert County in 1980. For information about the college’s history, visit CSM’s website. To view photos from the Lilly Naming Ceremony, visit here. For information on scholarships at CSM, click here. For information on donating toward scholarships at CSM, click here.